The Kazakh State Academic Opera and Ballet Theater named after Abay represented tour performances in Georgia on the stage of the Tbilisi Opera and Ballet Theater. The theater introduced Georgian public with the classical art of Kazakhstan performed by the brightest representatives of the opera and ballet stages on September 7-9. 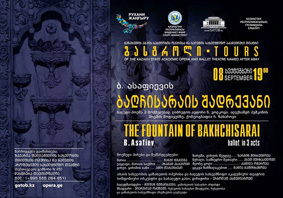 Abay - opera in 2 acts took place on September 7, while the ballet - Fountain of Bakhchisarai took place on September 8. 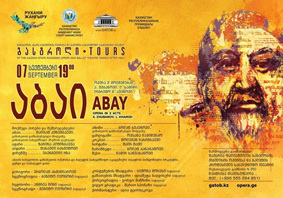 Opera "Abay" is not only a visiting card of the theater but also the main product of the opera genre in Kazakhstan. In recent years this opera has been reviving in new productions in opera houses in Almaty, Astana, and Shymkent. The gala concert on September 9 featured works of Kazakh, West European and Georgian composers performed by leading theater soloists, honored workers of the RK Gulzat Daurbaeva, Balapan Zhubaeva, Dina Dutmagambetova, Talgat Kuzembaev. The tour was supported by the Ministry of Culture and Sports of the Republic of Kazakhstan. Asakar Burybaev, artistic director of the Abay Kazakh State Opera and Ballet Theatre, thanked Badri Maisuradze, Artistic Director of Tbilisi Opera and Ballet Theater for hosting the event and presented him the poster depicting their first tour to Georgia in 1955 and Kazakh national clothes. Abay Opera House was built in Almaty in 1934 and named after Kazakh poet, composer, and philosopher Abay Qunanbayuli. Over forty western and Kazakh pieces are performed, including operas, ballets, and classical music performances. The building of the Kazakh state academic theatre named Abay, containing 793 seats, is one of the most known sights of the city of Almaty.